When I first posted about the Waterfield Zune HD suede jacket a couple of weeks back, I also emailed the people at Waterfield and requested they send me both versions to check out. I didn't particularly like any of the first three cases that I looked at - I tend to prefer cases that add little to no bulk to the device, but also completely protect it. The Waterfield cases are simple, but they work well. The first version is just the sleeve without the pocket ($9 USD), and the second has a pocket on the front ($13 USD, pictured above). The suede is soft enough to serve as a buffing surface for the Zune HD screen, and in fact if you apply a bit of pressure on the screen as you press upwards on the bottom of the case, you'll polish the screen as the Zune HD comes out. When the Zune HD is all the way in the case, it's about 1/3rd of an inch inside the top of the case so it's fully protected (I have it pushed up in the photo above). The cases are tight enough to not let the Zune HD slip out if you turn it upside down, but not so tight as to make it difficult to insert. 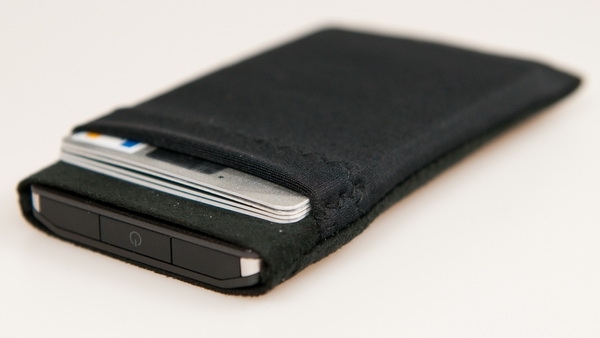 The case with the pocket on the front is capable of holding four credit cards easily, along with a few cash bills, and Waterfield says the elastic material can stretch enough to hold your headphones as well. Smaller headphones, like the ones that come with the Zune HD, work well enough - but bigger headphones such as the Ultimate Ears super.fi EB's are just too big to fit. The Waterfield Zune HD suede jackets are a simple, affordable, and effective way of protecting your Zune HD from scratches and scuffs. The case will do nothing to protect your Zune HD from drops or other rough treatment, but for my needs, these are a perfect solution.